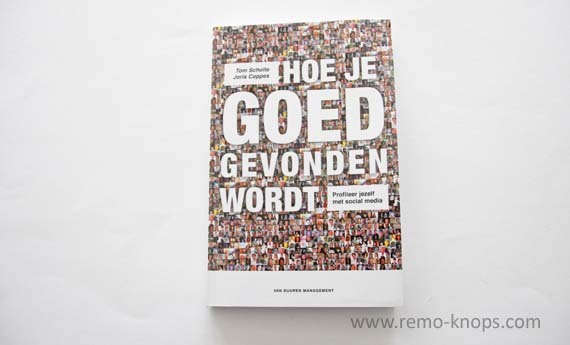 In this article I will review the book Hoe je goed gevonden wordt – Profileer jezelf met social media“, the latest book of Tom Scholte and Joris Coppes. Why, about what and how well are you being found ? 1. What do you do or plan to do ? 2. How do you do this ? 3. Why are you doing it ? Scholte & Coppes start the book with building the theoretical basics like the definition of a brand. Why does somebody drive a Porsche Carrerra GT3 (and nothing else)? Or why does someone buy a specific smartphone brand like Nokia? It is interesting to look at those brands with the three feelings in mind. Scholte & Coppes provide examples of personal brands, like Ruud Gullit or Linda de Mol. By looking at yourself as a brand and start to think about positioning yourself as a brand, both opportunities and questions come up. Scholte & Coppes provide a very simple three-step model to help you think about yourself as a personal brand. The three-step model is shown in the picture above. The basic personal branding questions on the left and actionable tools and means on the right. In the green building block in the third step consists of social media networks, LinkedIn, Twitter and Facebook. The main question that Scholte & Coppes will answer in the book is: “How social technology can help you with your personal brand(ing journey)? 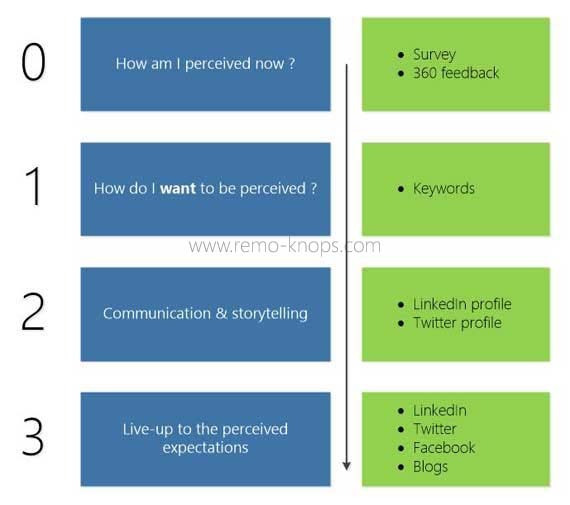 Scholte & Coppes have developed again a simple model that helps you to take the deep dive into personal branding and social media, when you’ve completed the three-step model. Each of the five layers will be discussed in more detail in the upcoming sections, since this is the core essence of developing your personal brand. Scholte & Coppes explain why the focus on results is a logical starting point. It helps you to focus and carve out your own niche as a personal brand. Have a look at the dynamics in your personal network when someone asks you for a expert becuase he/she has problem A. These bullets clearly help you think about the what-keywords, that describe you and your personal brand. For example results motivate and results inspire people. You could rephrase this question as “What is your way of working?”. You can get answers to this question via feedback from colleagues or friends. However a clear answer can really strengthen your LinkedIn profile, if you can show that you have certain personal. Scholte & Coppes state the why keywords are by definition suitable to share online, because you can touch people and let them make a real connection with you (and your driving forces). Practical examples are used to emphasize the practical relevance of the three strategies. Personally I do think that these strategies are still valid for the practical everyday business world and the strategies don’t just hold for the online social world. Scholte & Coppes distinguish three categories of means (for being found well). Eight behavioural characteristics that help you execute your strategies are: confidence, social, driven, enthusiastic, entrepreneurial, environmentally aware, expert and reliable. These behavioural characteristics and its combinations provide a pretty good overview of the person behind the social media profile. The communication message and tone, should reflect the the eight characteristics as defined by Scholte & Coppes. Symbolism is for example expressed in the brands you like, the clothing you wear or the colours you use on different social media profiles. In this book this is a pretty brief section, however in my personal opinion this is a pretty important aspect, that can enhance the overall message reflected by both your behaviour and communication. These activities are recurring topics in the upcoming chapters that cover specific social networks in-depth. When I analyze this model of Scholte & Coppes, I personally see similarities with the Business Model Canvas. Furthermore I see similarities as well with the future planning methodologies, presented by professor Roel Pieper during the Vision on the future symposium. Coppes & Scholte dedicate a chapter each on LinkedIn, Twitter and Facebook as the most important social networks. The Scholte & Coppes model consist of the activities building block (sharing, monitoring & respond). These activities will form the structure of the chapters that cover LinkedIn, Facebook and Twitter. Which means sharing knowledge, experience, your network, but also links to blogposts. Let new knowledge and information flow to you by monitoring what value others in your network share. Forward, reply, like or comment on the value shared by others. This is a simple way to let those people know you’ve read their message. Scholte & Coppes come up with smart applications or smart solutions for each social network. Those solutions will be particularly interesting for the LinkedIn-, Twitter- and Facebook power users. LinkedIn, Facebook and Twitter are certainly the most important social networks. Scholte & Coppes focus in this chapter on other channels or networks that could help building your personal brand. Google+, a social network operated by Google, Inc., launched on June 28th, 2011 with integrations across a number of Google products. YouTube was founded in February 2005 and has become the go-to site for video on the web. Google bought YouTube in 2006 and underwent a significant redesign in 2011. One hour of video is uploaded to YouTube every second. YouTube is the second largest search engine in the world. SlideShare is the world’s largest community for sharing presentations. With 60 million monthly visitors and 130 million page views, it is amongst the most visited 200 websites in the world. SlideShare has been acquired by LinkedIn in May 2012, making it a perfect professional asset to enhance your LinkedIn profile. Applications for most important social networks are available on almost any mayor smartphone platform. Windows Phone 7 has even integrated Twitter, Facebook and LinkedIn into its design, so it becomes really easy to sharing value, monitor social networks and respond to posts or updates. TweetDeck, Seesmic Desktop or Hootsuite are tools that combine the various social networks into one application. These type of tools help you easily monitor and share different content to different social networks. Scholte & Coppes focus on three types of connections that help you being found well online. First you can connect Twitter- and LinkedIn profile, which means that tweets are shown as status updates on your LinkedIn profile. Second you can connect Facebook- and Twitter profile, which means that every tweet is shown as a status update on your Facebook feed. Third you can connect other social networks to Facebook as well. For example Flickr if you would like to share pictures, or SlideShare to share PowerPoint decks, Spotify to share the music you are listening to or Runkeeper to share your exercises. It Is important to measure your popularity, influence and reach on various social networks. Scholte & Coppes provide some metrics and introduce tools like Klout and Peerindex that “measure your online influence from your social networks”. The book Hoe je goed gevonden wordt – Profileer jezelf met social media provides useful tips and tricks for both starters with social media as well as for advanced power-users. Scholte & Coppes focus on the use of social technology for personal branding purposes. This results in a clear focus on the individual, with a lot of practical and actionable handles. Open Leadership from Charlene Li, a book that I reviewed a little while ago, focuses on the advantages of social technology use in a corporate setting. The book includes a voucher to get extra information, special e-zines, external links and more. So the journey won’t end when you’ve finished reading Hoe je goed gevonden wordt. “Hoe je goed gevonden wordt – Profileer jezelf met social media” is written in Dutch and is available for the price point of € 24,95 via Van Duuren Management. 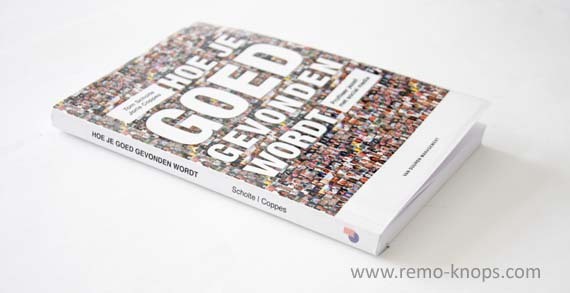 Hey!, I found this information for you: "Hoe je goed gevonden wordt (Coppes & Scholte, 2012)". Here is the website link: https://www.remo-knops.com/3794/hoe-je-goed-gevonden-wordt-coppes-scholte/. Thank you.